Look Mode shows the information for the species that is currently selected in the Species Explorer. If no species is selected then a message prompting selection of a species will be displayed. 1. The Show All button is not selected (ie raised). 2. The Notes Button is not selected. The notes button allows users to enter their own notes about a species. If the notes button is selected then only the User notes will be visible and ready for editing, and the notes provided by Hair ID will be hidden. 1. The current value of the search key. In this tutorial we have given values to some of the search key fields, so only those two species that match those values are visible. 2. The position of the Show All button. If the Show All button is not selected then only the species that match the search key will be visible in the Species Explorer. If it is selected then the value of the search key will be ignored and all the species in the database will be listed. Select a species in the Species Explorer by clicking on the small crosses to the left of the classification names to expand the Species Explorer until a species is visible then click on the species name. In this example the subclass Marsupalia has been expanded to show the families Peturidae and Marcopodidae, and Peturidae has been expanded to show the species Pseudocheirus archeri. 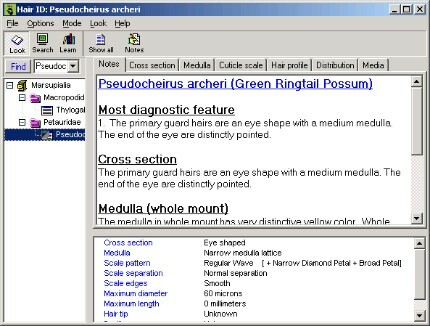 The Look View will show photographs and other data about the selected species on a separate view page for each diagnostic characteristic. To view the provided information and photographs click on the tabs. In this example the Notes tab has been clicked on so that the Look View is showing the Hair ID notes for the selected species. The notes highlight several important differences between the two species that distinguish between them. For example Pseudocheirus archeri has a distinct eye shaped cross section with pointed ends of the eye, while Trichosurus vulpecula has a cross section that is much more oval in shape. The Species Summary will show a summary of the diagnostic characteristics of the selected species. Note that the information displayed here corresponds directly to fields of the search key that are visible when in Search Mode. For each diagnostic characteristic the primary form of the characteristic is listed first, followed by possible variations enclosed in square brackets. When matching in Fuzzy mode both the primary form and the variations are included in the search. While matching in Exact mode only the primary form of diagnostic characteristics is matched. From reading of the Notes it is apparent that the shape of the Cross Section is a key factor in determining which species matches the sample of hair.